APHA Annual Meeting Blog: Go West! The wind is blowing a little cooler, the trees are getting a bit barer and this blogger has already seen her first Christmas commercial. All signs point to one thing: It’s APHA Annual Meeting time! 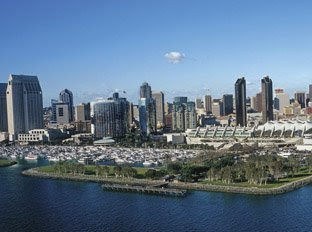 In less than one month, sun-filled, sandy beached San Diego will welcome about 13,000 public health workers for APHA’s 136th Annual Meeting, which this year has a theme of “Public Health Without Borders.” So, pack your bags, roll up your posters, and slip a few hundred business cards into your wallet (the Annual Meeting is a social networker’s dream come true) and join the public health pilgrimage to California. Just a few of 2008’s must-see highlights include opening session speaker Michael Marmot, chair of the World Health Organization’s Commission on Social Determinants of Health; a Wednesday afternoon closing session featuring three former U.S. surgeons general; a Monday afternoon town hall meeting on health system reform to which representatives from both presidential campaigns have been invited; and the Sunday night showing of Emmy Award-winning Sarah Jones’ “A Right to Care,” her one-woman performance piece. And, of course, don’t forget to sign up for daily e-mails from APHA’s Annual Meeting Blog. We’ll be posting multiple times a day, covering scientific sessions, social gatherings and other blog-worthy, can’t-miss events. And this year, the blog will also feature a list of daily top picks posted every morning, bright and early. For all the details, including this year’s online program, check out APHA’s Annual Meeting Web site. See you in 22 days! I am really looking forward to Sarah Jones. It's cool taht it is free.